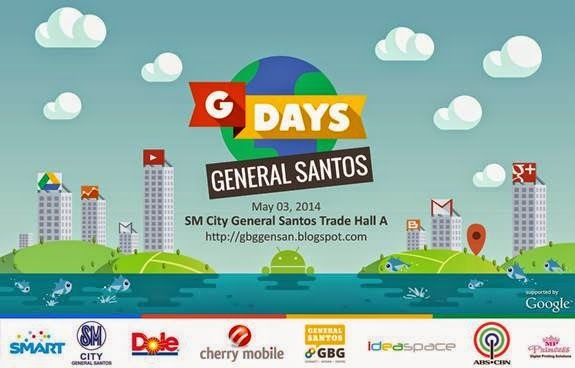 Everything is ready now for GDays General Santos, a community-organized event supported by Google happening this Saturday, May 3, 2014 at the Trade Hall A of SM City General Santos. An event that follows the format of Google GDays, it will be the biggest gathering of present and future members of Google communities (Google Business Groups, Google Educator Group and Google Women on the Web) in the region this year. Hundreds have registered and are expected to attend this FREE event. Most of them are particularly from the business and education sectors that are interested to learn more about Google technologies. And with Google Business Group (GBG) General Santos spearheading the event, for sure GDays General Santos will again turn out to be a phenominal success. Last year, GBG General Santos also hosted the GDayX Mindanao which gathered more than 400 participants. Read HERE. GDays General Santos is presented by Google Business Group - General Santos, SM City General Santos, SMART #LiveAllOut and Dolefil. It it also supported by Cherry Mobile, MP Princess Printers. The Media Partners are ABS-CBN Socsargen, PIA Soccsksargen and the SoCCSkSarGen Bloggers. Official caterer is Ranchero Nuevo.